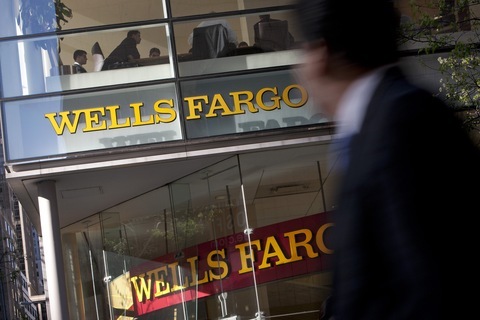 Wells Fargo & Co., the largest U.S. home lender, reported a 13 percent rise in its first-quarter profit in April, setting a record as the bank made more money on new mortgages and curbed losses from old ones. Photo by Scott Eells/Bloomberg via Getty Images. Question: If 11 million homeowners are “underwater”, how many stock owners are underwater? How about if you include investments via index funds or retirement funds? Seems likely, to me, to be ten- or twenty-fold greater. What makes home ownership a non-risk investment and who decides? Paul Solman: A very provocative question. The big difference with home ownership is that it is almost invariably financed with debt. When the house sinks “underwater” and is worth less than the debt being carried, it presents a strategic problem for the owner: Should s/he continue to pay or walk away? Note that retail buyers typically do the latter. As we reported in April 2010 in “‘Strategic Defaulters’ Skip Mortgage Payments as Home Values Tumble,” in December 2009, Morgan Stanley stopped making payments on five San Francisco office buildings worth half what they cost in 2007. In January 2010, developer Tishman Speyer gave two Manhattan apartment complexes on which it had borrowed $4.4 billion back to its creditors, including the California Teachers Pension Fund — current market value, $1.8 billion. The next month, the Mortgage Bankers Association sold its Washington headquarters, on which it owed $75 million, for $41 million. Continued ownership, said the MBA, would be economically imprudent. The fair comparison, then, might be between homeowners and those with stock who had bought on enormous margin (i.e., with mostly borrowed money). What would happen if they were unable to walk away from their debts, I wonder. As for the totals, your math could use a bit of tweaking. First of all, it seems that as many as 15 million homeowners may be underwater, not the 11 million you posit. But even with your lower number, it strains credulity to the point of hernia to imagine, as you do, that 10-20 times that number of stockholders are similarly sunk. That would be 110-220 million of us. It seems further that only 55 percent of Americans report stock ownership — somewhere in the neighborhood of 120 million people, total. Your “seems likely” estimate suggests, therefore, that roughly 100-200 percent of all U.S. shareholders are net losers on Wall Street, a range that goes from the implausible to the impossible. Or, were we talking about underwater housing population instead, from the subprime to the ridiculous.